In this world, every individual has a mother. But Truth is the mother of the entire humanity. Those who follow this mother will never face any difficulties in life. The worldly mothers are bound by space and time and will have to leave their bodies at one point of time, but Truth is not limited by space and time and remains the same in all the three periods of time. It is the master of all the three worlds. So, everyone must necessarily follow such a noble mother. The term Devi refers to such a noble mother. Devi is your Divine Mother. This Goddess Devi is also called Sathya Swaroopini, which means She is the embodiment of Truth. So, worshipping Truth amounts to worshipping the Goddess Devi. If you understand and follow this Truth, you will be successful in every field. Vedas also proclaims this Truth. Devi is also referred to by various names such as Durga, Lakshmi, Sarasvathi, etc. She is described as the embodiment of Shakti, the universal energy. The supreme Shakti manifests herself in the form of Durga, Lakshmi and Sarasvathi. Durga grants to us energy - physical, mental and spiritual. Lakshmi bestows on us wealth of many kinds - not just money but intellectual wealth, the wealth of character and others. Even health is a kind of wealth. She grants untold riches to us. And Sarasvathi bestows on us intelligence, the capacity for intellectual enquiry and the power of discrimination. One's own mother is the combination of all these Divine beings. She provides us energy, wealth and intelligence. She constantly desires our advancement in life. So she represents all the three goddesses that we worship. The term "Devi" also symbolizes the three gunas (or attributes) namely Sathwa, Rajas and Thamas. Devi takes the Rajasic form to suppress the forces of evil and protect the Satwic qualities. 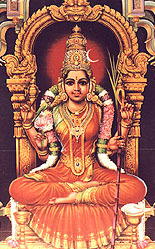 When the forces of injustice, immorality and untruth have grown to monstrous proportions and are indulging in a death dance, when selfishness and self-interest are rampant, when men have lost all sense of kindness and compassion, the Atmic principle, assuming the form of Shakti, taking on the Rajasic quality, seeks to destroy the evil elements. This is the inner meaning of the Durga form of Devi.. When the Divine Goddess is in dreadful rage to destroy the wicked elements, She assumes a fearful form. To pacify the dreaded Goddess, Her feminine children offer worship to Her with red kumkum (sacred red powder). The Goddess seeing the blood-red kumkum at her feet, feels assured that the wicked have been vanquished and assumes Her benign form. The inner meaning of the worship of Devi with red kumkum is that thereby the Goddess is appeased. The significance of Durga, Lakshmi and Sarasvathi has to be rightly understood. The three represent three kinds of potencies in man. Ichchaa Shakti, will power, Kriya Shakti, the power of purposeful action, and Jnaana Shakti - the power of discernment. Sarasvathi is manifest in man as the power of speech, Vaak. Durga is present in the form of dynamism. Lakshmi is manifest in the form of will power. The body indicates Kriya Shakti. The mind is the repository of Ichchaa Shakti. The Atma is Jnaana Shakti. Kriya Shakti comes from the body, which is material. The power that activates the body that is inert and makes it vibrant is Ichchaa Shakti. The power that induces the vibrations of Ichchaa Shakti is Jnaana Shakti, which causes radiation of energy. These three potencies are represented by the mantra Om Bhur Bhuvah Suvaha. Bhur represents Bhuloka, the earth. Bhuvah represents the life force, conscience in man. Suvaha represents the power of radiation. All three are present in man. Thus Durga, Lakshmi and Sarasvathi dwell in the human heart. Men are prone to exhibit rajasic qualities like anger and hatred. They are the menacing manifestations of Durga. The extolling of the Divine in song and poetry and the pleasing vibrations produced by them indicate the power of Sarasvathi. The pure qualities that arise in man such as compassion, love, forbearance and sympathy are derived from Lakshmi. When people worship Durga, Lakshmi and Sarasvathi externally in pictures or icons, they are giving physical forms to the subtle potencies that are within them. The unfortunate predicament of man today is that he is not recognizing the powers within him and developing respect for them. He goes after the external, attracted by the physical forms. The relationship between the material and the subtle has to be understood. The remedy for man's life is contained within himself. But man seeks remedies from outside. All that is needed is to turn the vision inward to experience the Divine within. Convert your ichchaa shakti into a yearning for God. Convert your kriya shakti into a force for doing divine actions. Convert your jnaana shakti into the divine Itself.